California's most famous gold rush dates to the morning of January 24, 1848, when James Marshall made his customary inspection of the sawmill he was building for John Sutter. During the previous night, Marshall had diverted water through the mill's tailrace to wash away loose dirt and gravel, and on that fateful day, he noticed some shining flecks of metal left behind by the running water. He picked them up and showed them to his crew, but while he was pretty sure that it was gold, the full significance of his discovery was truly impossible to imagine. He was still concerned about getting the mill finished. Word of Marshall's discovery leaked out and immediately set off a "rush to the mines." By the spring of 1849, the largest gold rush in American history was under way. At the time of Marshall's discovery, the state's non-Indian population numbered about 14,000. By the end of 1849, it had risen to nearly 100,000, and it continued to swell to some 250,000 by 1852. Gold was both plentiful and - by happy geologic accident- easy to extract, making the gold-bearing gravels of California's rivers into what has been described as "the finest opportunity that, has ever been offered on any mining frontier." A contemporary newspaper put it slightly differently: "The whole country, from San Francisco to Los Angeles, and from the sea shore to the base of the Sierra Nevadas, resounds with the cry of 'gold, GOLD, GOLD!' while the field is left half planted, the house half built, and everything neglected but the manufacture of shovels and pickaxes." The riverfront embarcadero and commercial district of the Gold Rush preserved at Old Sacramento teemed with activity as would-be miners disembarked from riverboats and regrouped before setting out for the Mother Lode. Outfitters and other merchants there thrived on the gold trade, portrayed in the re-created Huntington & Hopkins Hardware Store. The mining boom that Captain John Sutter himself set in motion nearly destroyed his Nuevo Helvetia agricultural empire headquartered at Sutter’s Fort. A portion of his Mexican land grant became the bustling Gold Rush boomtown of Sacramento. While gold-seekers were pouring through Sacramento and into the Sierra, deposits of the precious metal were also discovered in the Klamath Mountains of northwest California. Today, ruins of the historic town of Shasta and the Chinese temple at Weaverville Joss House State Historic Park recall the days of the Klamath gold rush. In combination, the Mother Lode and the Klamath gold fields produced the modern-day equivalent of more than $25 billion in gold before the turn of the century, with operations continuing at Empire Mine until as late as 1956. 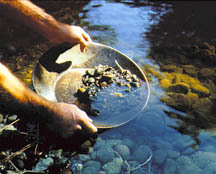 Between the 1860s and the turn of the century, prospectors found gold in a number of locations in California. One of the Wests largest authentic ghost towns is Bodie in the eastern Sierra Nevada, now a state historic park that preserves the abandoned buildings of the rough-and-tumble mining town that sprang up in response to a gold strike in 1877. At Cuyamaca Rancho State Park, visitors can tour the remains of the Stonewall Mine, which produced $2 million worth of gold between 1870 and 1892. At Picacho State Recreation Area on the lower Colorado River, visitors can view Picacho Mill, the last visible remnant of Picacho, a gold mining community that boasted a population of 2,500 in 1904.